The Lot and Garonne is a friendly place of just over 300,000 inhabitants. It is surrounded by the Périgord to the north east, the Landes to the south west, the Gers to the south and by two major cities linked by the A62 motorway going through Agen: Bordeaux and Toulouse. It is a land linking the Quercy and the Landes regions. The countryside is hilly and is crossed by two beautiful rivers: the Lot and the Garonne. These rivers meet at Aiguillon. It is a mostly rural area. The Lot and Garonne is very fertile. It has orchards, vineyards and general farming. The main produce is prunes (which become the famous Agen prunes), tomatoes, wines of Buzet and Duras, melons, strawberries and asparagus... 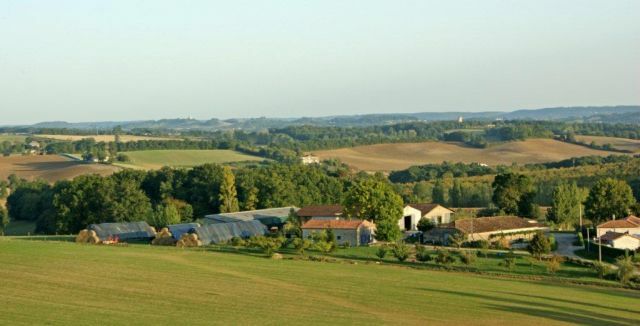 It is the most productive agricultural province of the Aquitaine region. This is a region where the inhabitants live a healthy lifestyle and eat a healthy diet. There is a mixture of cultures and the people are very sociable. It is an agricultural region attracting an outside workforce. Today, the Lot and Garonne appeals to tourists for a variety of reasons: land of Bastides and Castles, rural tourism and river tourism (200 km of waterways) orchards and many outside sporting activities; it is a tourist attraction for culture, relaxation, sport and gastronomy. The climate of the Lot and Garonne is influenced by the Atlantic Ocean to the west, therefore, it is oceanic and mild with less rain and wind than Les Landes. It is warm but often wet and stormy in summer. The average temperature differential between summer and winter is more noticeable than in Les Landes and less noticeable than in the Perigord to the North. It is a region of climatic transition where some extreme weather can be seen. There are heavy frosts in winter and heat waves during the summer. This is a land full of history. Henri IV and Jeanne D’Albret came from this area. Situated between Bordeaux and Toulouse, between Guyenne and Languedoc, the Lot and Garonne experienced many different influences. Agenais was first part of the Aquitaine region in the first centuries AD, before experiencing the wars between the King of France and the King of England. These battles often went either way, upstream or downstream from Agen. Victories in these battles were often short lived. Either under Toulouse, English or Bordeaux influence, the Lot and Garonne, for a long time had very flexible borders. Administrations overlapped, some were influenced by Toulouse and others by Bordeaux; plus the powerful Albret family exerted authority in the Nérac region. For a long time the Garonne River was considered a natural border between the north and the south of the region. Under Louis XI, Agenais was aligned with Bordeaux, its parliament and the government at Guyenne. Created in 1790, the limits of the Lot and Garonne as they stand today, date back to 1808. At that time the borders with the recently created Tarn and Garonne, were fixed in the south east. However, things were not that simple, some regions naturally leant towards the Dordogne to the north, Gers to the south or the Landes to the southwest. Also the choice of the capital between Agen and Aiguillon was a topic of debate. Aiguillon argued its privileged and natural geographic position at the junction of the Lot River and Garonne River but Agen was designated capital due to its historic heritage. Agenais stretches naturally around Agen, the prune capital and administrative centre with 32,000 inhabitants. Wander the old streets of Agen and you will find a pleasant town with a rich history dating back to Roman times. Val de Garonne/ Gascony. This is a land of orchards, rivers and canals, from Casteljaloux to Marmande, and from the Garonne to the borders of the Landes forest. Lot and Garonne offers many treasures: castles, churches, priories, mills, museums and nature reserves giving the visitor many reasons to stay in the region. See our chapter "Tourist Attractions". Visit our chapter on Gastronomy! Like the whole southwest region, Lot and Garonne gastronomy is very rich. The region produces a huge amount of delicious fruit and vegetables and has very well developed organic farming. All these products are used in the Lot and Garonne cuisine by famous local chefs using prunes in their dishes for unexpected flavours …Try Michel Trama’s 2 stars Michelin Guide restaurant “the Aubergade” in Puymeirol. Look in our section entitled "Restaurants". There are many different types of accommodation in the region. Check our section "Accommodation". There are campsites, guesthouses, self-catering accommodation, holiday villages, Bed & Breakfasts and hotels of all ratings. From the most luxurious room to the most basic one, you will find something to suit you in the Lot and Garonne. You can uncover the treasures of the beautiful Lot and Garonne by cycling along the many cycling paths; walking along the country trails or navigating by boat on the 200km of waterways, rivers and canals. Water sport activities are popular in the Lot Valley. You can also watch rugby etc. For more information visit our chapter “Entertainment”. Jean Pierre Fourcade (politician), Jean François Poncet (politician), Bernard Palissy (potter, engineer and craftsman), Bernard Campan (actor), Francis Cabrel (singer- songwriter), Chimène Badi (singer), Michel Polnareff (singer song-writer), Paul Guth (journalist and writer), Michel Serres (philosopher), Jean Nouvel (architect), André Téchiné (screen writer and film director), Maurice Mességué (herbalist and author), Philippe Sella (rugby league), Albert Ferrasse (president of French rugby); there are all proud of their region. Various publications and documentation from the Lot and Garonne Tourist Offices.